Every business needs to keep fire extinguishers on hand. Every business needs to keep fire extinguishers on hand. When you’re a business owner, it’s also worth it to guide your employees through the fire evacuation procedure, and what else to do when a fire breaks out. Sometimes fire alarms will go off for insignificant reasons like a toaster that burns a bagel. Still, that doesn’t mean you won’t need a functioning fire extinguisher. Where the fire extinguishers are in your building really depend on what fire hazards you might face. Then it depends on the type of fire extinguisher that you need in the first place. There are five primary classes of portable fire extinguishers, and they are: class A, B, C, D, and K. Class A fire extinguishers are suitable for most common fires, which means that they can be placed in office spaces, classrooms, and anywhere people will assemble, like a lecture hall or auditorium. 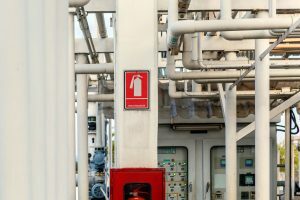 Class B fire extinguishers should be found in workshops, garages, service areas, and manufacturing facilities where flammable gases and liquids are at risk of igniting. Class C fire extinguishers need to be kept near electrical equipment since they are best suited for dealing with electrical fires. Class D fire extinguishers, on the other hand, are best suited for areas where heavy industry and metalworking is taking place. Class K fire extinguishers are best suited for commercial kitchens, and anywhere else a cooking fire could be started by oil, fats, or grease. It’s a misconception that you need to keep your fire extinguishers far apart from each other. It’s a bad idea to put them out of reach because then your employees won’t be able to access them when they need them the most. For instance, when it comes to Class A fire extinguishers, there should be one for every 3000 square feet that your building contains. Employees shouldn’t have to move more than 75 feet to get one. Once you have determined your fire evacuation route, you should post maps around the building. This map should also display where fire extinguishers can be found. How Do I Mount Them? All fire extinguishers should be mounted on the walls where they are found. They should be kept secure so that they can’t be tampered with at all. While the handle needs to be in easy reach, heavier units can be kept closer to the ground so they are not as much of a burden to lift. You should also put signs close to wherever you place your fire extinguishers. That way, they are much easier to find, especially during a crisis when your employees won’t be thinking clearly because they’re trying not to panic. This entry was posted on Friday, September 28th, 2018 at 2:22 pm. Both comments and pings are currently closed.